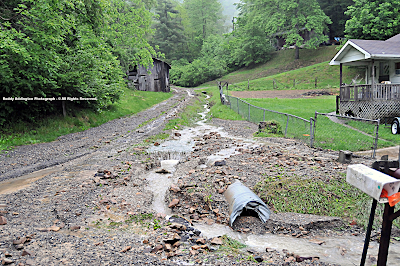 The High Knob Landform: May 2010 - Flash Flooding Strikes Again! 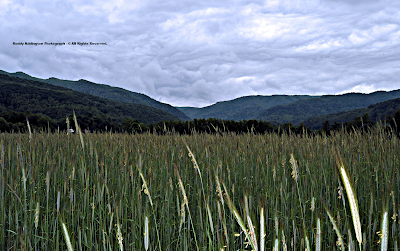 Hay grass heads sway gently in cool air on the floor of Powell Valley, amid a welcomed break from turbulent conditions observed during recent days! 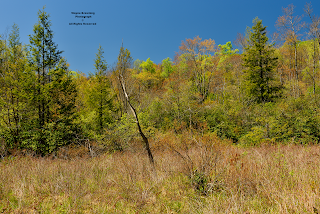 [ Daytime temps varied from 44 to 50 degrees on Eagle Knob, atop the highcountry adjacent to the Valley, with 59-60 degrees being reached in Norton and Wise. A rather chilly but refreshing respite from days of volatile May weather ]. 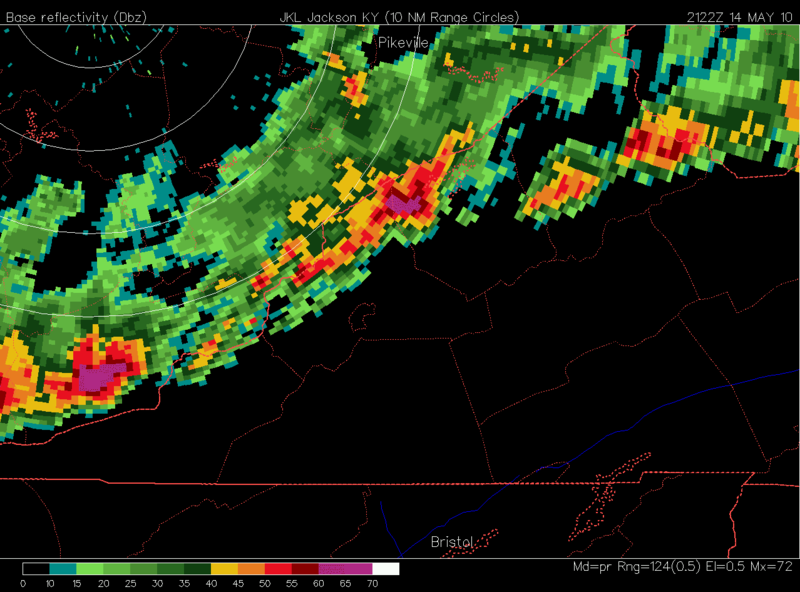 [ The above image documenting a severe thunderstorm over Clintwood, one of several with high reflectivity hail cores. A gush of rain, driven by 40 to 50 mile per hour winds, gave way to large hail ( up to 1.00" in diameter ) forming within cumulonimbus cloud towers rising 9.5 vertical miles into the heavens! ]. A red flag was waved by Mother Nature to warn of upcoming conditions, as the first lines of strong thunderstorms pushed into the mountains during afternoon hours of May 14. The hail core on the Clintwood thunderstorm did not even show up distinctly within the big picture, as repetitive storms generated the highest Doppler rainfall estimates for the day via a combo of hail + torrential rains ( hail often causing Doppler Radar to greatly over-estimate rainfall due to the highly reflective nature of ice surfaces ( analogous to bright-banding with sleet ) ). 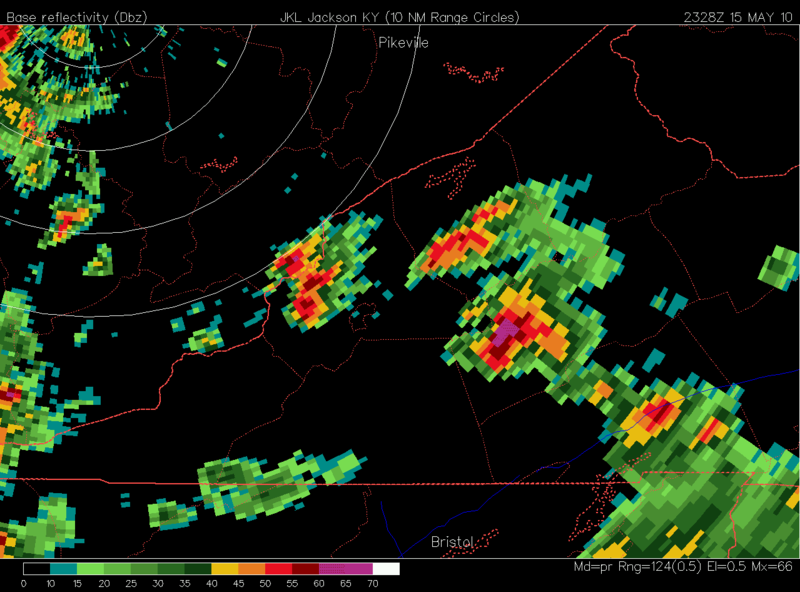 [ Hail to golf-ball size was reported east of Grundy, in Dwight, within the bright streak shown over Buchanan County ]. 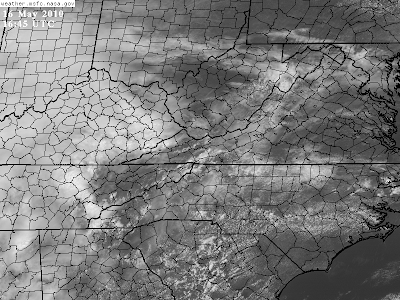 Air cooled nicely in the wake of May 14 storms, with subsidence mixing lower dewpoint air down into the highcountry to aid cooling and drainage into adjacent valleys ( with 50 to 55 degree morning minimums being felt into May 15 ). Most of the daylight hours of May 15 were nice, with temps in the 70s to around 80 degrees. A notable signal was observed at times during the afternoon, with Doppler detectable echo streamers periodically flowing off the High Knob Massif in the mean wind field ( from SW to NE ). [ These have been observed many times in the past, and are indicative of an orographic-atmospheric interaction in which a cap aloft is holding back air forced upward over the massif from breaking through an inversion aloft ( i.e., the cap or lid ). 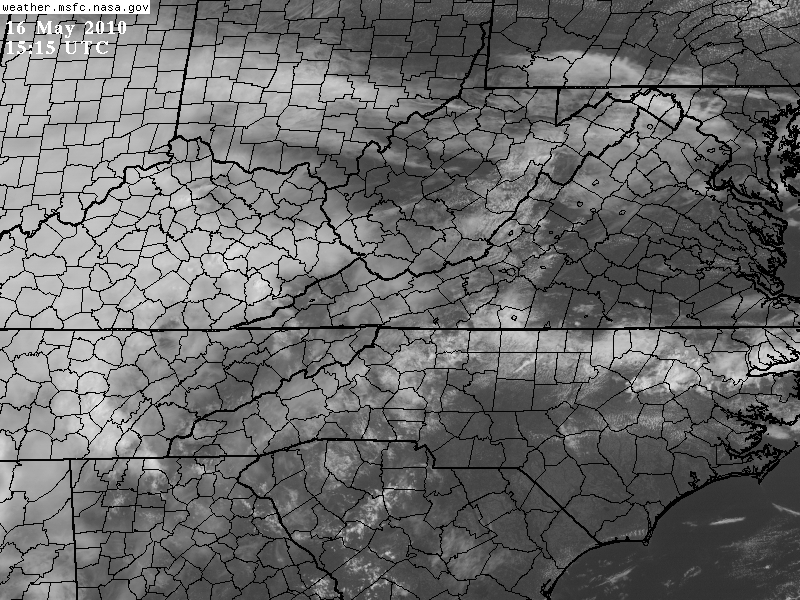 This builds up Convective Available Potential Energy, called CAPE for short, while suppressing actual thunderstorm formation ( often signaling that it will explode before the day-evening is over ) ]. [ An adjacent thunderstorm formed over southern Dickenson County subsequent to the High Knob Massif convection, and upstream of its former streamers, to suggest that it was at least partially driven by orographic gravity wave influences rippling through the atmosphere leeward of the massif ]. 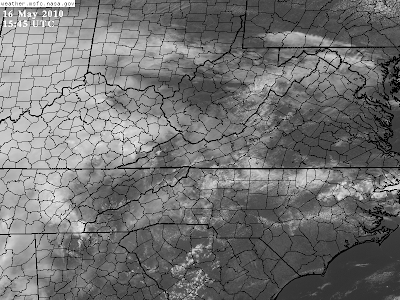 Sure enough thunderstorms rapidly exploded over eastern portions of the High Knob Massif between 6:00 and 6:30 p.m., well ahead of more organized convection which had fired earlier in the day over the southern Blue Ridge and Cumberland Plateau in Tennessee. During the next hour, High Knob Massif thunderstorms moved off the highcountry into the Clinch River Valley as adjacent storms continued to develop near the Virginia-Kentucky stateline. 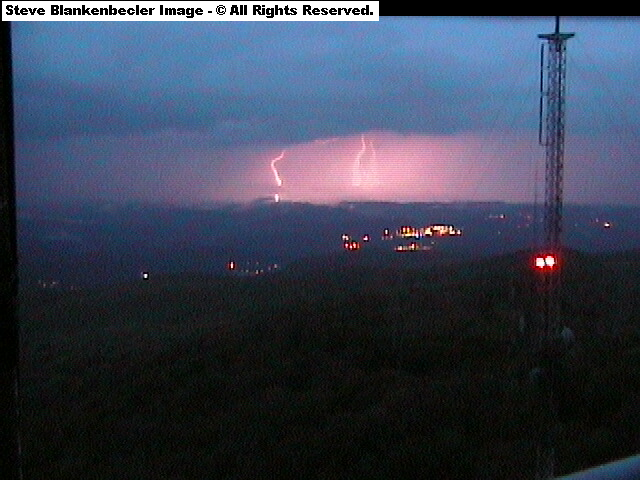 [ When thunderstorms fire over eastern portions of the High Knob Massif, such a propagation is relatively common when steering winds aloft are weak. 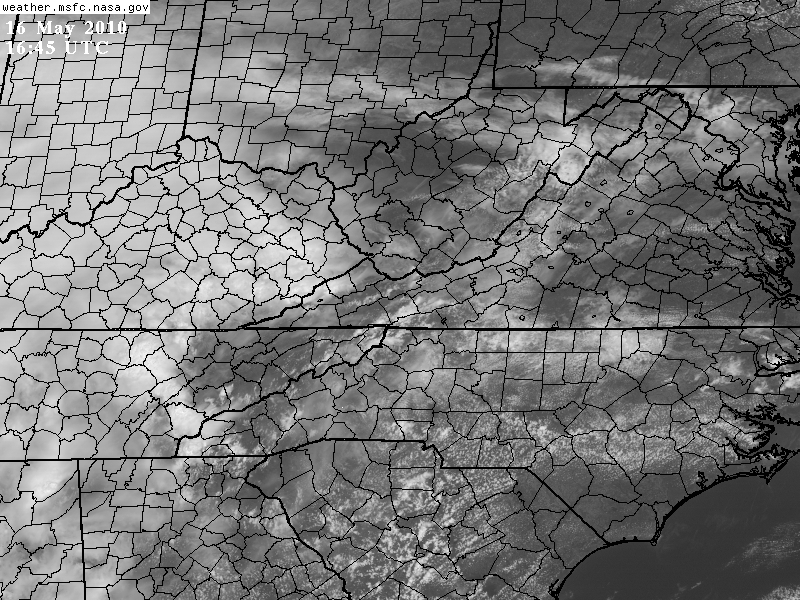 Since eastern portions of the High Knob Massif slope downward toward Guest River Gorge and the Clinch River Valley, there is a natural tendency for rain cooled outflow air to also follow mean gravity vectors and to flow downward off the highcountry into the Clinch Valley of Russell County ( the outflow forming a boundary which acts like a mini-cold front to sustain and reform the thunderstorms, often with intensification as they ingest the warmer, more buoyant air of the Clinch Valley ). 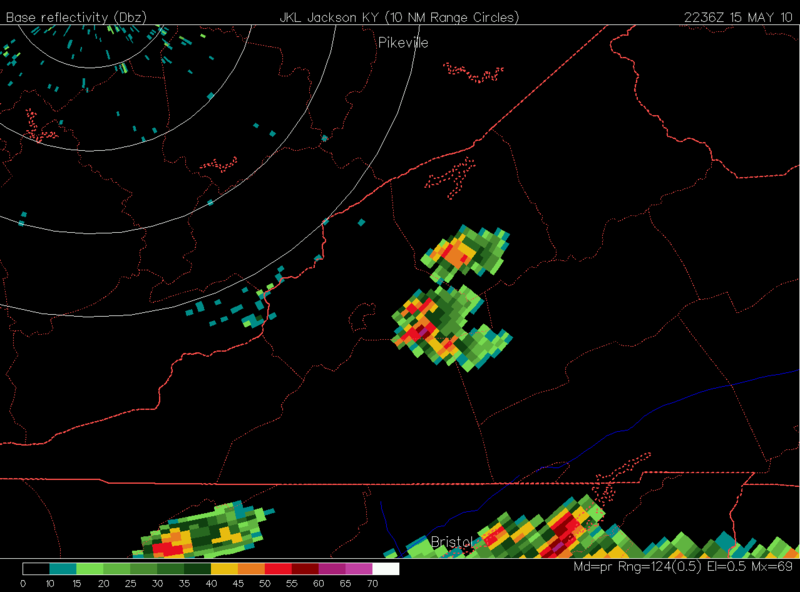 Merely one example of how the High Knob Massif impacts weather conditions in adjacent locations ]. [ Lights from the town of Wise, and Norton-Wise Shopping Center Complex, are visible in the middle ground past the dual blinking lights of the Blue Ridge Public Television ( PBS ) Tower. 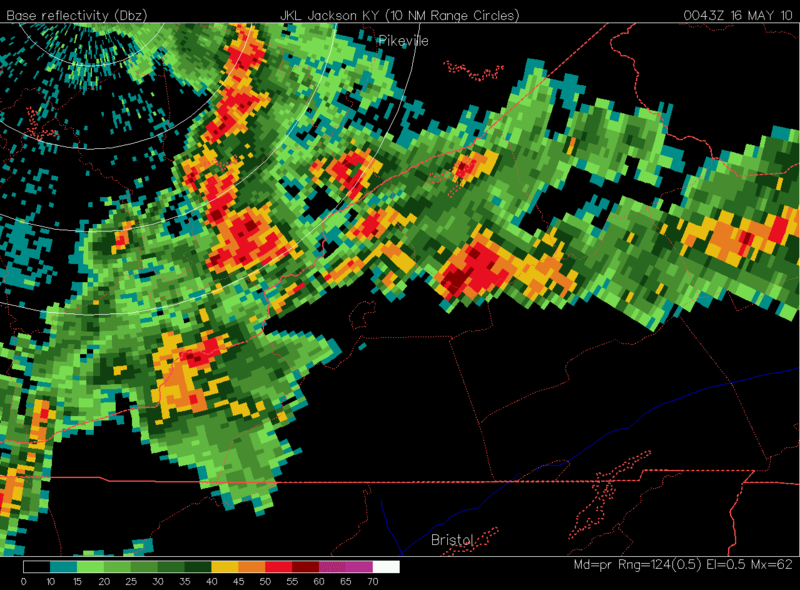 The cloud to ground strikes are north of Wise, toward Pound. 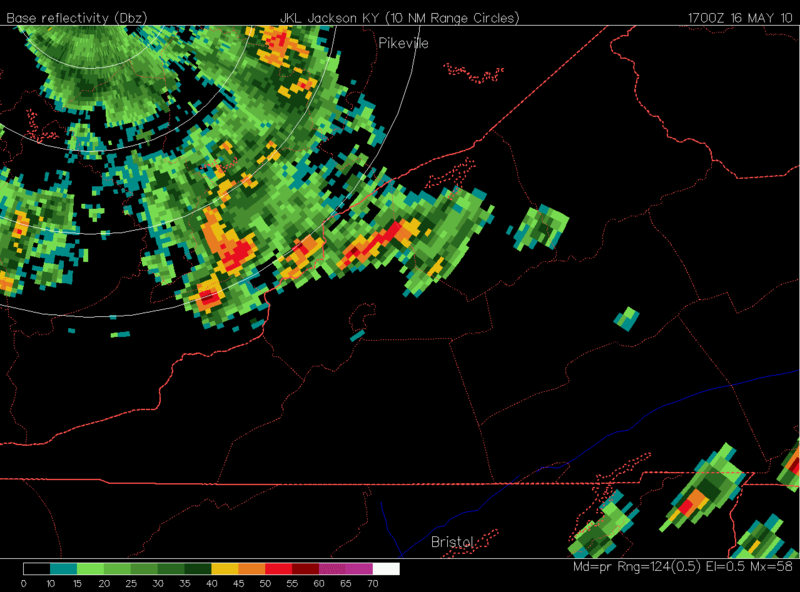 Thunderstorms responsible are shown on the next image ]. Simply amazing cloud to ground lightning strikes were captured from above the 4200 foot level on Eagle Knob of the High Knob Massif by Steve Blankenbecler, at 8:46 p.m., on May 15. The above Doppler scan was taken 3 minutes prior to the vivid cloud to ground lightning strikes captured by my friend Steve Blankenbecler. 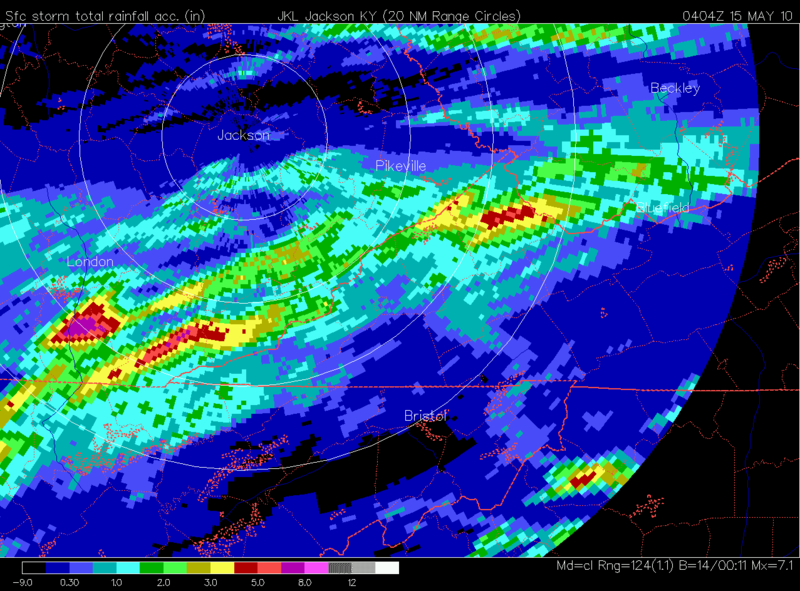 By conclusion of May 15, the big news was that much of Wise and Dickenson counties had taken a pretty good ( or bad ) late afternoon and evening hit! A focus of heavier rainfall was noted along the Tennessee Valley Divide, and from northern slopes of the High Knob Massif into central parts of the Clinch Valley of Russell County. 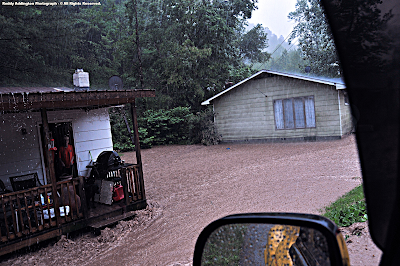 [ Local rainfall totals topped 2.00", with my friends Wayne & Genevie Riner officially measuring 1.83" at Nora 4 SSE along the Long Ridge section of the Tennessee Valley Divide ]. Of special and most important significance, however, to setting the stage ( antecedent conditions ) for significant flash flooding on May 16, would be the combined rainfall totals observed during the May 14-15 period ( 2.42" at Nora 4 SSE, with locally 3.00"+ ). 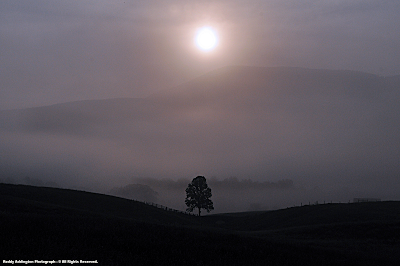 The daylight hours of May 16 began innocence enough, with no local activity until early afternoon. As often occurs, the High Knob Massif played a distinct role in what would soon happen as the first downpours developed just lee of its northern slopes near Norton. 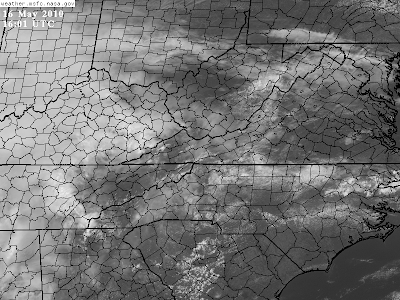 A series of NASA Visible Satellite Images reveals how these clouds originated over the High Knob highcountry, which continued to feed energy into the developing convection over northern Wise County even as it missed the flash flooding rains. 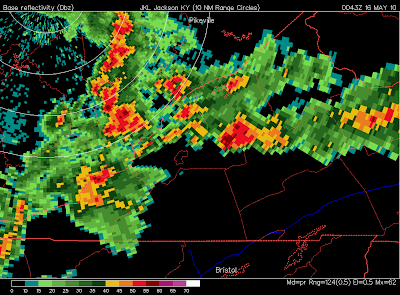 Doppler during this time showed that the initial convection near the city of Norton, illustrated by the previous radar image, propagated N to NW into northern Wise County to a position where some merger could occur with storms moving along the Kentucky side of the stateline. 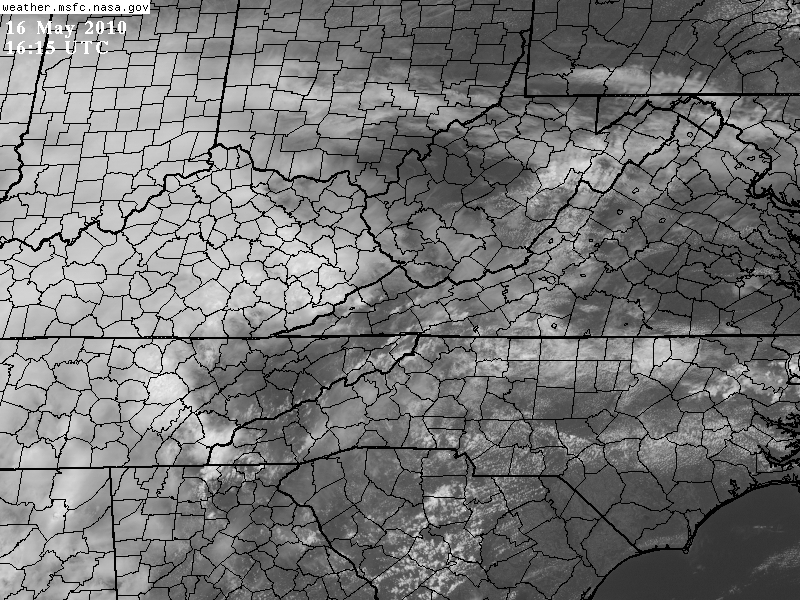 [ Unlike orographic forcing situations, in which sustained S-SW winds are driven downslope leeward of the High Knob Landform and Tennessee Valley Divide, there can be a tendency for leeside troughiness in weak S-SW flow amid thermal instability settings into the axial zone of the Middlesboro Syncline of northern Wise and Dickenson counties ( zone of concave stratigraphy ) ]. Torrential downpours, with some backbuilding of convection, dropped a Doppler estimated 2.00" to 3.00" of rain over the Indian Creek drainage of northern Wise County during the 1-hour period ending at 2 PM on May 16. [ It barely impacted the upper Cranes Nest River Basin, which had 2 feet of vertical rise at the river gage southeast of Clintwood ]. 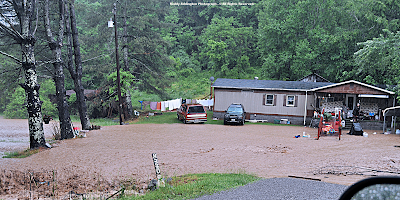 This was the time period which triggered significant flash flooding in the Pound area, with up to 3.00" of rain falling upon soils already saturated ( from 1.50" to 3.50" of rainfall during May 14-15 ). 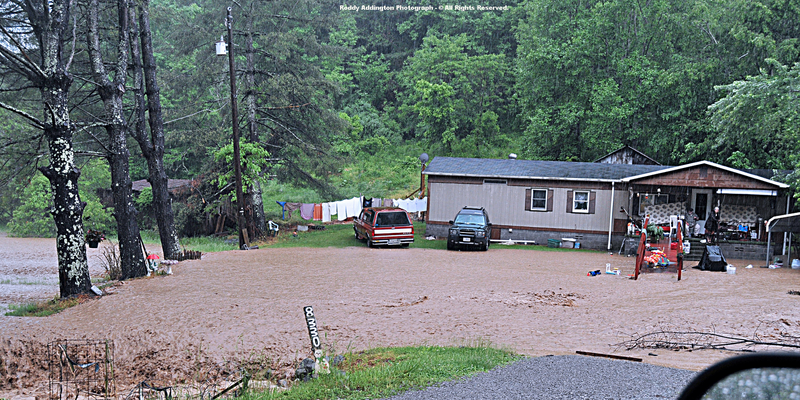 It was a true deluge of torrential rainfall. 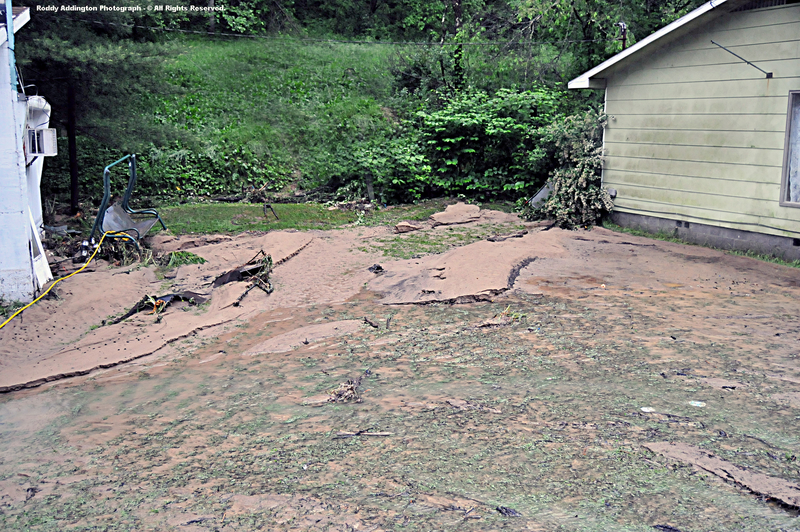 It struck so fast, with a RAPID 3+ feet of water rise! 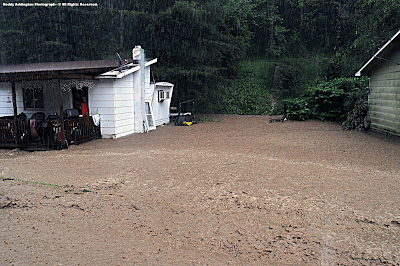 [ Imagine if it had been after dark, when many flash floods occur. The water could have been around and within many homes before residents even knew what was happening ]. Flooding forced the closure of numerous roads, including U.S. 23, gullied secondary roads, exposed drain pipes, got into a few homes, and deposited tons of sand and debris. The good news, no one was seriously hurt or killed. 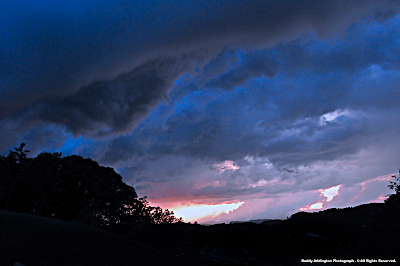 Flash flooding during May 16 did not end the turbulent conditions associated with this weather system, as skies over the Wise Plateau illustrate near sunset above. [ The Storm Prediction Center issued a Severe Thunderstorm Watch for much of the area from 3 to 9 PM on May 17, with some of the strongest activity actually moving across the mountains between 9 PM & Midnight ]. Another round of showers & thunderstorms crossed the mountains May 18, with Norton and parts of the High Knob Massif picking up more than 1.00" of new rainfall during May 17-18. 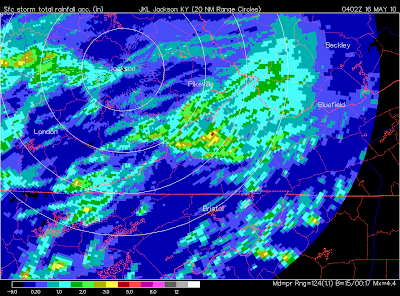 [ Most interestingly, the heaviest rains during this period flanked much of the main crest zone of the High Knob Massif ( including the hard hit Big Cherry Basin of early May ), with only 1.25" to 2.50" of new rain being common during May 14-18 ]. 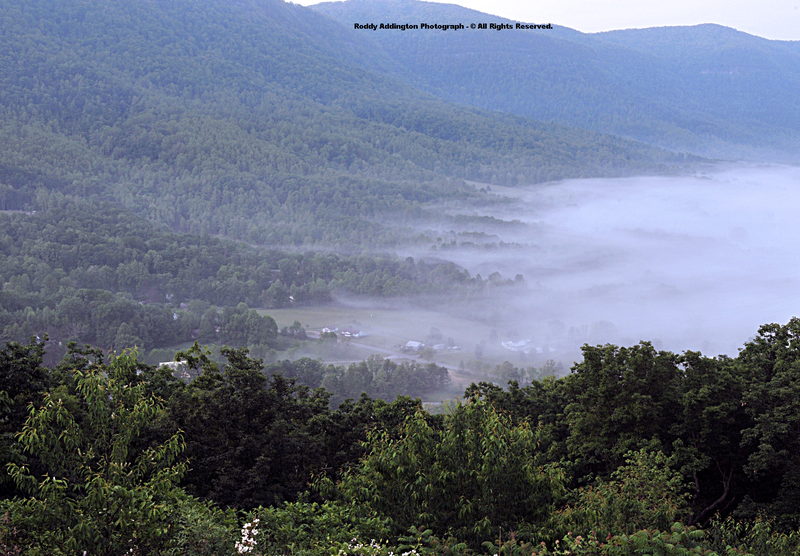 [ Fog is a common feature amid Powell Valley of the High Knob Massif, with the wetness of May 2010 generating a bounty to give some morns a majestic Scottish Highlands flare! ]. 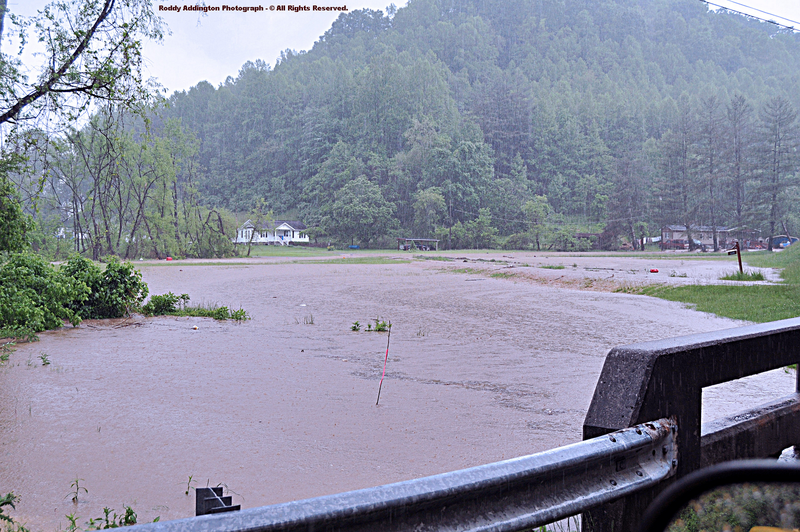 The end result of early-mid May conditions has been wetness, with 5.00" to 8.00"+ of rainfall being common across Dickenson, Wise, Lee, and northern Scott counties during May 1-19. The lights are on, or so it seemed, as sunrise above mountain walls of the High Knob Massif illuminated a Powell Valley gazebo during a recent fog-shrouded morning. What a way to wrap this update! An inversion has formed across lower elevations, below 2000 feet, with temps in mountain hollows of the Russell Fork Basin being up to 10 degrees cooler than in the Norton Valley ( e.g., Clintwood 1 W at 1560 feet is 10 degrees cooler than the 600 foot higher Norton Valley ). 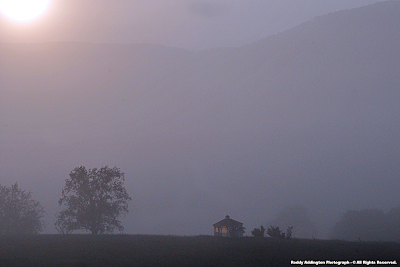 Nocturnal inversions are common, but tonight is a little different. Typically, the Norton Valley gets cooler than Clintwood 1 W.
Tonight mixing on S-ESE winds leeward of the High Knob highcountry is keeping the air in Norton mixed so well that Midnight temps were actually above that of Lonesome Pine Airport ( 2684 feet ) in Wise. ( Norton is often much cooler at night than the highly exposed Airport site, via cold air drainage into the Norton Valley from off the High Knob Massif ). 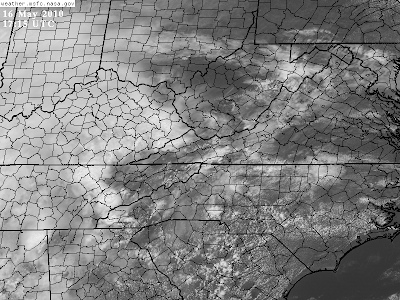 Breezy to gusty S-ESE winds are generating the differences, with temps cooling with elevation again into middle 50s above 4000 feet on High Knob. Sound waves tend to travel for long distances as they bounce back and forth between the ground and low-level inversions, such that tonight its possible to hear sounds far away relatively clear if you happen to live in a location within one of these inversions. Sounds such as the first night songs of the Yellow-billed Cuckoo ( Coccyzus americanus ) heard during 2010 on a distant ridge! 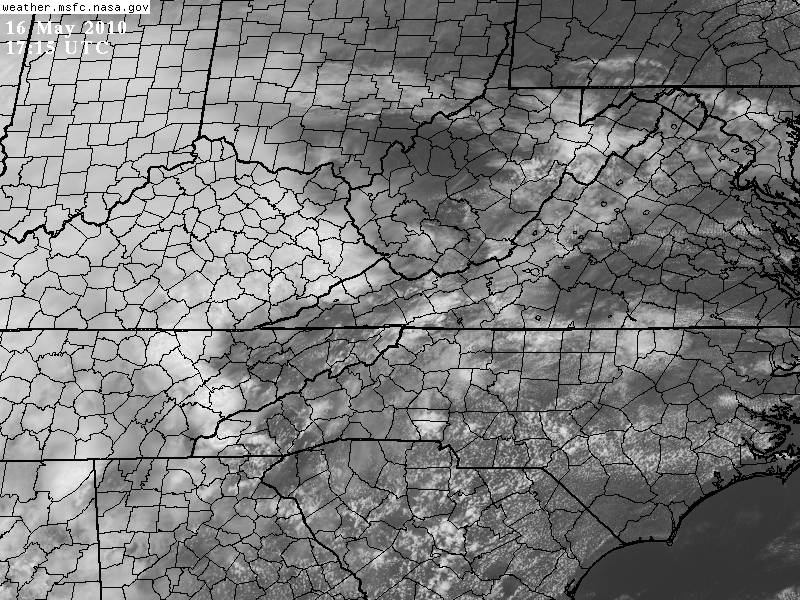 A distant low elevation ridge top, as sounds being generated above 2000 feet are being bounced and reflected upward in opposite directions at my location ( i.e., its likely that the precise elevations and thicknesses of these inversional layers vary with your location ). 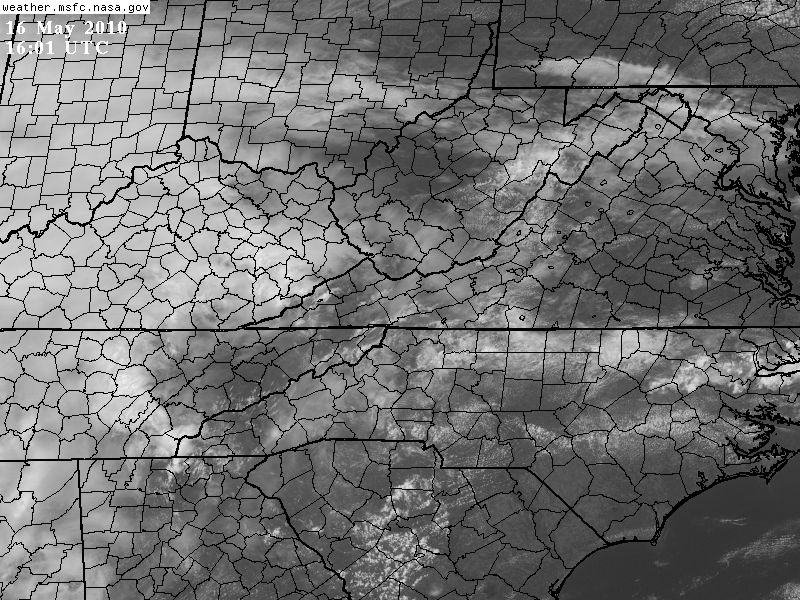 [ For example, valley inversions above 2700-3000 feet in elevation are common amid the High Knob highcountry ]. One of only a few birds to sing at night ( excluding Owls ), the Yellow-billed Cuckoo is certainly interesting. Although it can not be told where it is singing exactly, it is certain to be below 2000 feet since if it was above that elevation ( in my area ) it's song would bounce upward toward the next inversion and could not be heard below! Many other sounds are also audible tonight, as enhanced waves transport & channel them throughout the hollows ( testimony again to the amazing fluid nature of our atmosphere ).